TUNIS – Trade unionists arrested and tortured. Protesters shot dead by police during demonstrations. Journalists in jail. And a great censorship to prevent the spread of protests and protect the international image of a country which was visited by 6.7 millions tourists just in 2007. We are speaking about Tunisia. A country which is also known for its emigration. Since many years, thousands of Tunisians cross the Mediterranean towards the Italian islands of Lampedusa and Pantelleria. During the first half of 2008 about 1,287 Tunisians landed on the Italian shores. They look for a better life. But what do they leave behind? To understand what Tunisia has become, we visited one of its hottest regions. The mining area of Gafsa, 400 km southwest of Tunis. Here it started - ten months ago - the most important social movement of the Country during the last 20 years. A spontaneous and popular movement of people which keep on struggling despite the repression and censorship. The region of the mines looks like a lunar landscape. But under the grey mountains among Moularès, Redeyef, Mdhilla and Metlaoui there is a treasure: 600 million tons of phosphate. The mines are held by the public Phosphate company of Gafsa (CPG). In 2008 the price of a ton of phosphate rock doubled because of the growing demand of fertilizers in China and India. Tunisia is the fifth producer in the world and has still reserves for the next 100 years. Yet the region of Gafsa is one of the poorest. The technical modernization of mining reduced the number of employees by 55% in the past 20 years, from 11,000 to 5,000. And it caused a serious economic crisis in the towns of miners, built from scratch during the French colonization to house the workforce in the early twentieth century. Today, unemployment affects 40% of young people. Young people who often have no other way out except burning the borders, as they say in Arabic. Harrag. Towards Libya and then Lampedusa. These are the young people who started the protest ten months ago. On 5th January 2008 I was in Redeyef, a town of 37,000 inhabitants. The CPG published the results of a public examination for the recruitment of 80 employees. But the list was considered fraudulent. The young unemployed rebelled and occupied the secretariat of the regional miners' union (Ugtt), considered to be involved in the scandal. They were soon joined by 11 widows who asked CPG to respect the quota allotted to the sons of deaths at work. The other sections of the trade union joined the protesters. Meanwhile in Tunis, a national committee was created in solidarity with the people of the mines. On 4th April, a day of solidarity was held in Tunis, with the participation of some trade unionists from Redeyef. But on their return, the morning of 7th April, they were arrested together with dozens of activists. Among them there was also Adnan Hajji, the secretary of the union of teachers in Redeyef. The same day the city's teachers suspended classes and called for a general strike that lasted for the following three days. On 9th April around thirty women descended to the streets asking for the freedom of their husbands. The city joined them and hundreds of people marched towards the prefecture. The day after, the trade unionists were released. At their arrival into the city, a crowd of 20.000 people welcomed their new leader, Adnan Hajji. Meanwhile some solidarity initiatives started also in France, organized by Tunisian migrants, especially in Nantes, where a large community from Redeyef lives. In the mining area demonstrations went on. On 6th May 2008, Hicham Ben Jeddou died from electrical shock while a group of young unemployed occupied the generator of Tabeddit in sign of protest. Witnesses accused police of having turned on electricity knowing that he was touching the wires. It was the beginning of the repression. 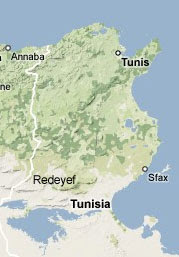 Reinforcements were sent from Tunis to the mining area. Police checked all the accesses to Redeyef. And plainclothes agents monitored the main actors of the protest. On 6th June, police opened fire on a demonstration. A guy, Hafnaoui Maghzaoui, was shot dead. And 27 people were injured. One of them, Abdelkhaleq Aamidi, died after three months in hospital, on 14th September. Within a few weeks, two hundred people were arrested. Trade unionists as well as ordinary people. The night between 21st and 22nd June the leader of the protest Adnan Hajji was arrested again. The movement was beheaded. But no woman was arrested. And so the women, the wives of trade unionists and activists in jail, returned on the streets, on 27th July, demanding the release of prisoners. Among them there was also Zakiya Dhifaoui. Born in 1966, she is journalist and teacher. 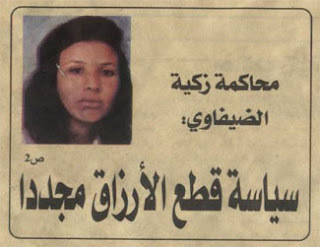 She came from Kairouan to write a report on the opposition newspaper Muatinun. But her report will never be published. Because that day Dhifaoui was arrested. Her arrest was a message sent to all the Tunisian journalists: don’t come to Redeyef and don’t write about it. It is the other side of the repression: the censorship of any sensitive information. 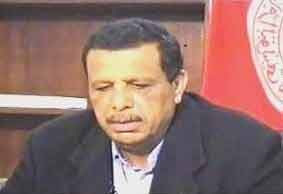 Dhifaoui was sentenced to four and a half months of prison. But she is not the only journalist in jail. Actually it is the freedom of expression itself to be judged. The web sites Dailymotion and Youtube, where the videos of the demonstrations and of police violences have been uploaded, are banned since November 2007. Masoud Romdhani, spokesman of the National solidarity movement, has been beaten by plainclothes agents in Tunis. Amor Gondher, journalist of the opposition newspaper Tareq el Jedid, was beaten by two policemen on the evening of 26th June, in Nefta. Boulqaddous Fahim, a journalist of El Hiwar TV - which published the video of Redeyef on the Italian satellite channel Arcoiris - is reported to be missing since 5th July, as he run away in order to escape his arrest warrant. The author of those videos, Mahmoud Raddadi, was arrested on 21st June. Raddadi and Boulqaddous will soon be judged together with 38 other protesters, including 14 trade unionists. They are accused to have formed a combination for unlawful purposes. The hearing will begin at the end of November at the Court of Gafsa. 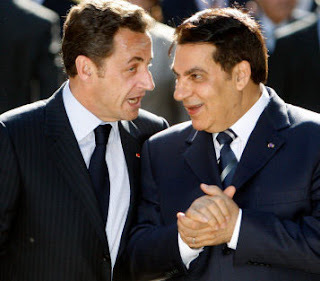 Without any doubt this is one of the greatest political trials under the presidency of Ben Ali. A presidency which has been lasting uninterrupted since 1987. In November 2009, the presidential elections will take place. The deaths of Redeyef will not be enough to undermine the power of the Constitutional Democratic Party (RDC). Nor to revive the opposition after years of repression of dissent. The defense lawyers know that the judgement has already been written. But in history there is an accumulation... says one of them, under anonymity. As the Tunisian poet Abou el Kacem Chebbi claimed a century ago: "When people choose life, fate must respond, night must brighten and chains must break".